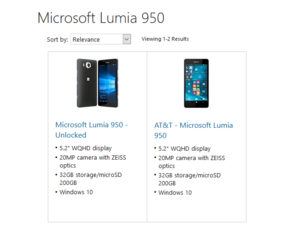 Microsoft now lists both of its upcoming Lumia phones on the Microsoft Store, but neither are available for pre-order. Microsoft loves nothing more than a long build-up to a product release, and the Lumia 950's slow stroll towards launch sure drives that home. Weeks after initially revealing the Windows 10 Phones, the Microsoft Store is finally listing the Lumia 950 after posting the 950 XL earlier, as noticed by Windows Central. There are actually two listings for the device: an unlocked version and the AT&T only build. Just like its larger XL cousin, however, the 950 is not yet available for pre-order—you can only scope out its detailed tech specs on Microsoft Store site. Both phones are supposed to roll out in November. As a refresher, the 950 features a 5.2-inch display, a 1.8GHz Qualcomm Snapdragon 808 processor, a 20 megapixel rear-facing camera, a 5MP video chat camera, 32GB of storage, and a microSD slot that accepts up to 200GB cards. When Microsoft announced the new phones in early October it said they would come with some interesting features, including Iris recognition for Windows Hello logins. The larger Lumia 950 XL is also packing a “liquid cooling” set-up for the processor to deal with the handset’s powerful graphics capabilities. Now, thanks to the YouTube channel Kaption LAB, we’re getting what appears to be our first look at a teardown detailing the 950 XL, as first reported by Windows Blog Italia (Google Translate link). The disassembly shows that the XL is packing a front-facing infrared sensor for Windows Hello for the Iris recognition. Microsoft’s liquid cooling comes down to a flat copper tube that runs over the CPU. Why this matters: While it’s hard to call a Windows mobile device highly anticipated, there is at least higher than normal curiosity about Microsoft’s new phones—mostly because of the interesting new features the phones promise, such as Continuum, which lets you run a Windows-y desktop experience right from your phone. 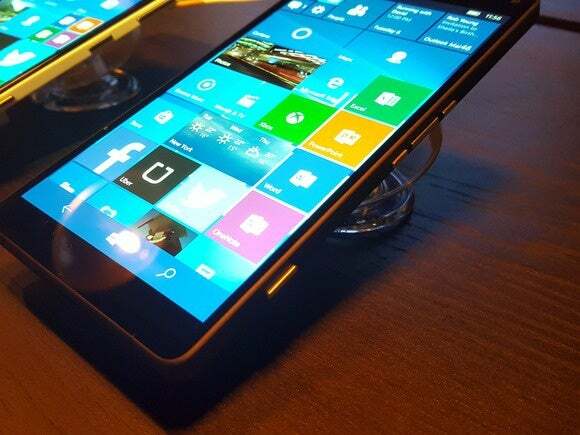 As our own Mark Hachman said during his hands-on time with the 950XL, “this is the Windows Phone flagship we’ve been waiting for.” At the very least Windows mobile fans will be pleased.